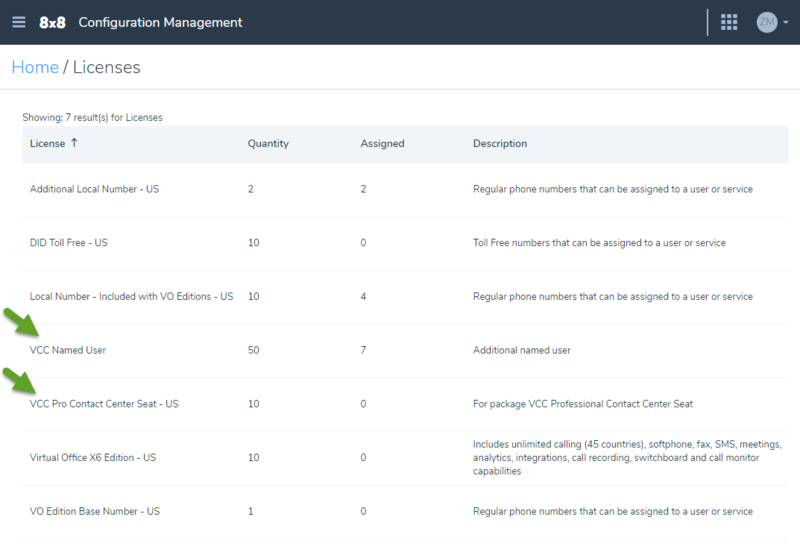 The license type you assign to a user determines the scope of available phone features, such as basic calling to advance collaborative capabilities. A list of available and active licenses for the tenant are shown under Services and permissions. You can choose any license from the license drop-down, whether upgrade or downgrade. When you downgrade a license, the user's phone number, extension number, call forwarding rules, and other shared settings between licenses are preserved. The system automatically changes the features that are not shared between the licenses such as Switchboard Pro or Virtual Office Analytics. For example, when you downgrade a user license,Virtual Office Analytics automatically changes from Supervisor to Essentials. When you upgrade a license, however, you still need to configure the user profile to allow the new feature capabilities. In the above example, you need to modify the user profile to allow the supervisor capabilities instead of regular user for Virtual Office Analytics. Depending on your subscription, the licenses can be Virtual Contact Center Editions or X Series. For details, see our content on Review Licenses. Note: Due to billing irregularities experienced with upgrading and downgrading user license from the user page, this feature is temporarily unavailable. 3. Assign a new license to the user. Go to Home > Users and click to edit an existing user account or create a new user. Select and Assign a policy profile. The 8x8 Master User Template is selected by default. With the 8x8 Profile Policy you are able to restrict users from using certain capabilities of Virtual Office, such as accessing Virtual Office Meetings, upgrading to recent version of Virtual Office Desktop app, or accessing and deleting call recordings. You can disable these features company wide by using a master profile policy. To modify the 8x8 Master User Template, go to Home > User policies and click to edit the options. See Review Profile Policy. Click to Assign one or more services to user from the list. Go to Home > Users, and click Services and permissions while editing a user. Select a different license from the drop-down list. If you already have a license and would like to add a second Virtual Office, or a Virtual Contact Center, click + next to the first license. Select and add a new license from the list. 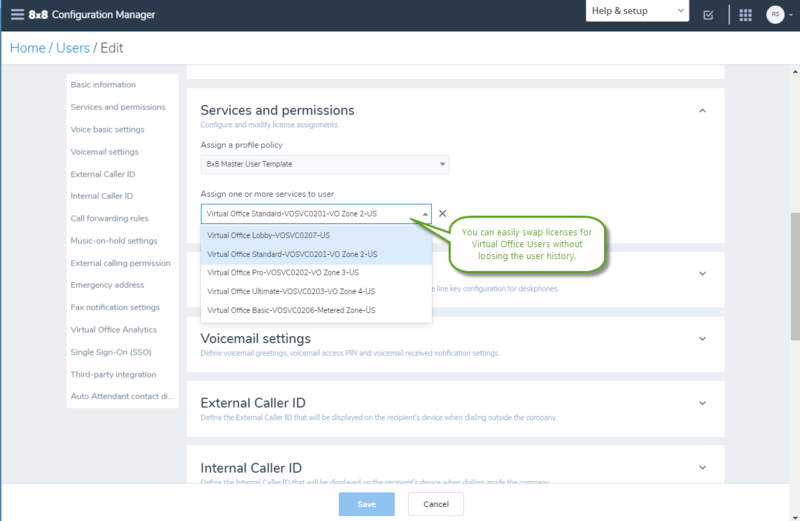 - You cannot swap licenses for Virtual Contact Center or VO-VCC users. - There is no restrictions specific to regions (UK or US). Go to Home > Users and click Services and permissions while editing a user. Click X next to the license. You receive a message that removing a service can affect the user capabilities. To quickly view a user license information, go to Home > Users and click on any user in the list. The Info Panel displays the information related to that user including the user's services and permissions. To have a general view of the list of licenses, their quantity, and descriptions go to Home > Licenses. You can also see how many of those licenses have been assigned to users. For the latest available licenses and services at 8x8, Inc., visit https://support.8x8.com. Cost centers are created in the service cloud and allow you to keep track of expenses for each department, site, or location. If a cost center is already defined for your company, you can assign a cost center to a user via User > Service Selection > Cost Center.